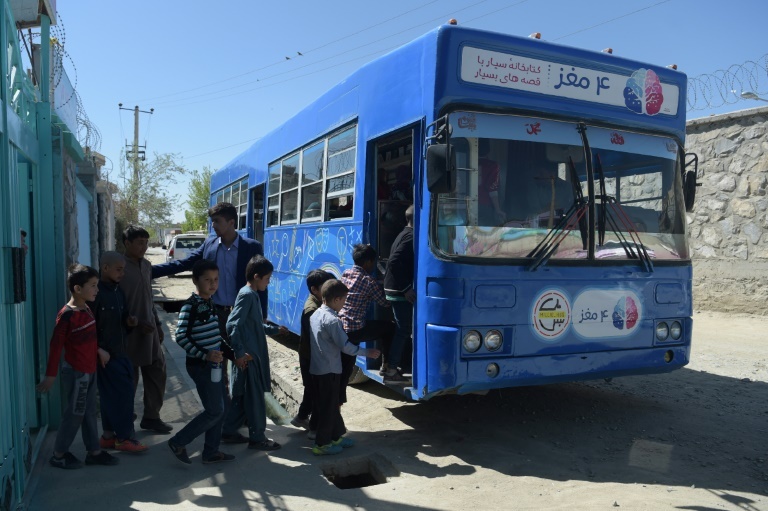 KABUL: The door of the blue bus slides open and dozens of children excitedly bound up the steps, eager to get their hands on hard-to-find books in Kabul’s first mobile library. Named Charmaghz, the Dari for walnut, which is associated with logic in Afghanistan because the nut resembles a brain, the converted public bus is hard to miss as it winds through the dusty streets of the Afghan capital. The library-on-wheels offers pupils and street kids free access to children’s books, which are in short supply at public schools and libraries. It also offers one of the few spaces outside the home that children can use in a city where fear is increasingly keeping residents behind closed doors. As both the Taliban and the Islamic State group step up their attacks in Kabul, with civilians paying the price, many parents, traumatised by the violence, some of them already devastated by loss, have stopped taking their children out in public. The vehicle, which is rented from a state-owned bus company and takes precautions to avoid government buildings, main roads or other crowded areas targeted by militants in Kabul, is a relatively secure place for them to read, play chess and see friends. “Boys, you sit in the back and girls in the front. It is important to be organised,” one of three volunteers tells the children as he pulls books from an overhead shelf and places them in outstretched hands. Unlike traditional libraries where chatting is discouraged, the constant hum of voices fills Charmaghz. Children sit cross-legged on the carpeted floor or at desks reading aloud from some of the 600 books that have been donated by Afghan publishers. 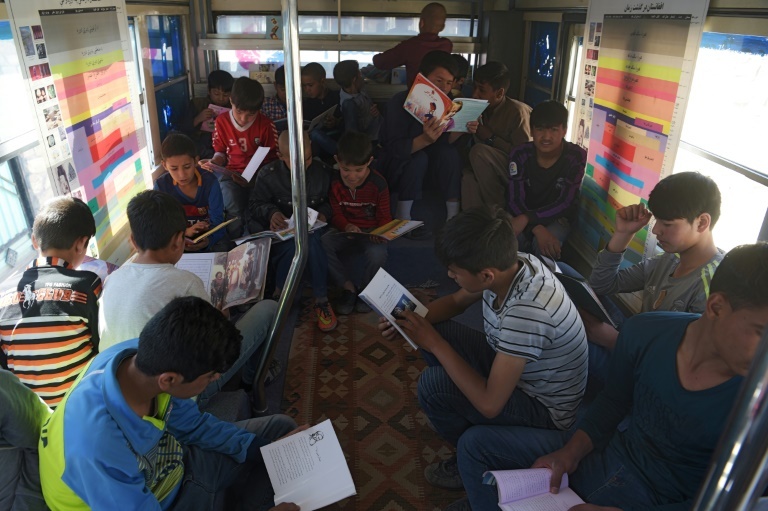 “I come to the bus once a week to read books,” 13-year-old Zahra told AFP. The library bus was launched in February by Oxford University graduate Freshta Karim, who has dedicated herself to improving the reading and storytelling abilities of children in Afghanistan, an opportunity she never had as a child. “When we were children we did not have access to… libraries for children,” Karim, 26, told AFP. 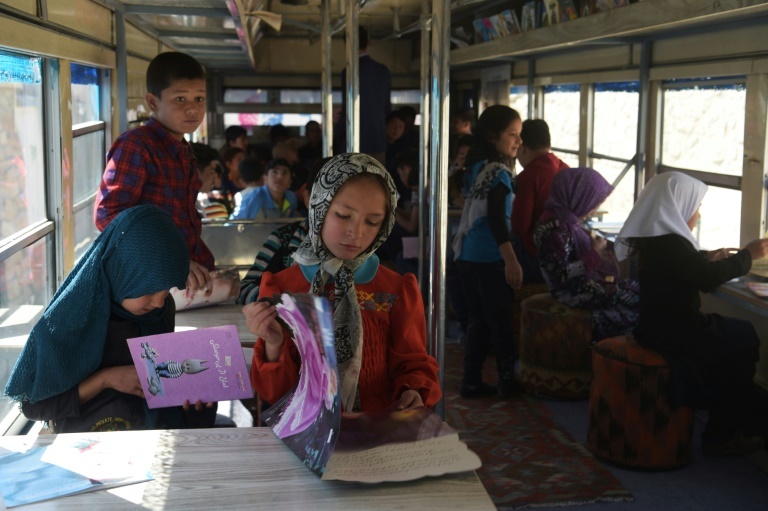 The library bus stops at schools, parks or orphanages throughout the week, and is an “efficient” way to reach lots of children, Karim said, helping to improve Afghanistan’s low general rate of literacy of just 36 percent. Even now most public schools in Afghanistan do not have libraries, said Shafiullah, who used to work at Kabul’s main public library and now helps non-profit organisations publish children’s books. 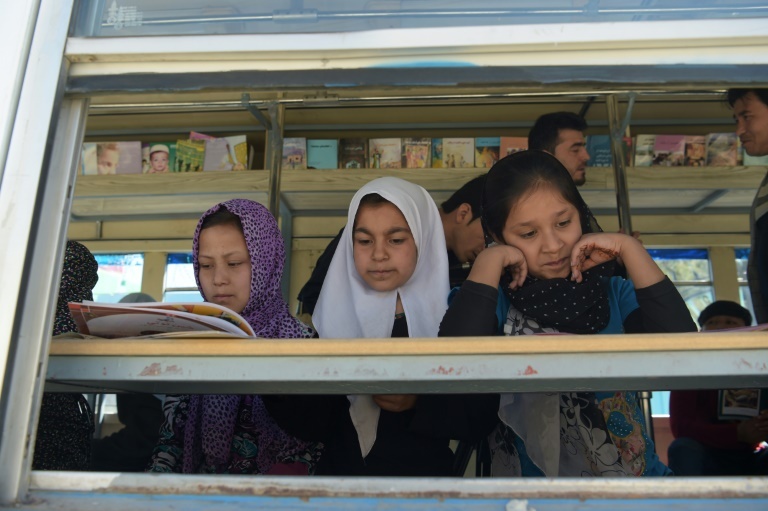 “Young people and children do not have access to different types of books except their school textbooks,” Shafiullah, who like many Afghans goes by one name, told AFP. Abbas said the library bus had given him access to books he could not find at his school. “At school, you have a limited choice. You don’t have a lot of books. But here you can find a whole range,” he told AFP. More than eight million children are enrolled in schools across Afghanistan this year, official figures show. But 3.5 million other school-age kids will miss out due to school closures, grinding conflict and poverty. Karim is realistic about the changes to literacy the mobile library can achieve in a country the size of Afghanistan. But it is a start, said Karim, who is hoping to garner enough donations to rent another two buses. “I don’t think a mobile library will solve the thousands of problems that we have in our education system,” she said.